What is the roof 'pitch'? The ‘pitch’ is the angle or slope of the roof. How do I determine the 'pitch' of my roof? First you will need a level (2′ or longer) and a ruler. From the outside – Place one end of the level on the roof, hold at a level position and measure out from the end of the level resting on the roof 12 inches, this is you horizontal measurement, from this point measure down the distance from the bottom of the level to the roof, this is your vertical measurement. Example – 12″ horizontal measurement and 4″ vertical measurement would be a 4:12 pitch. From inside the attic – Place one end of level against the bottom of rafter (a rafter is usually a 2″ X 6″ wood board that follows the slope of your roof), hold at a level position, measure out from the end of the level that is against the rafter 12″, this is the horizontal measurement, from this point measure up from the top of the level to the rafter, this is your vertical measurement. Example – 12″ horizontal measurement and 5″ vertical measurement would be a 5:12 pitch. Note: Copper Summit, Inc. does not recommend that you measure your own roof pitch! Please contact a qualified and insured builder or roofing contractor. Note: Copper Summit, Inc. is not liable for any accidents or injuries while measuring the pitch of your roof, nor are we liable for any orders placed with any incorrect measurements. What is the proper size for a cupola or finial? The proper size of a cupola or finial will mainly depend on what kind of support you have inside of the attic. The cupolas range in weight from 35 pounds to 50 pounds. The finials average weight is 15 pounds. The height of the product is based on your desire, however a one-story home would usually have at least a 12″ x 12″ x 60″ finial or a 30″ x 30″ cupola. In selecting the right size of a cupola for your structure, there should be one and one quarter inches of cupola base for each foot of unbroken roof line. Example: For 20 foot of unbroken roof line, the minimum cupola base size would be 24 inches. One other factor to consider is the amount of attic space. The more attic space, the larger the cupola should be. How long does it take to receive the products once I place an order? Our current lead time, on standard products, is 2 weeks. Custom orders will vary depending on size, amount of custom work, etc. Will Copper Summit, Inc. install products I purchase? Copper Summit, Inc. does not install products. How does the copper hold up in different weather conditions? All products do not weather at the same rate. There are several variables that can determine the rate in which a product will weather. The main variables for copper are air quality and rain. Cupolas and finials may attract lightning. Proper lightning deterrents need to be put in place by a professional when installing cupolas or finials. Copper Summit, Inc. assumes no responsibility of lightning incidents even with the proper additions of lightning protection products. (i.e. conductors, grounds, fittings, etc). What is the weight of the copper? The copper we use is 16 oz. It is possible for copper to stain certain architectural materials. Unauthorized returns will be refused and the customer will be responsible for freight on any such items. No returns accepted without prior written authorization. A 25% restocking fee applies to all approved returns on standard items. All orders are processed as received and every effort will be made to meet your delivery requirements. Copper Summit, Inc. is not liable for any delay in the delivery of products or any damages or failure of delivery. Deliveries should be opened immediately upon receipt – prior to signing bill of laden – this includes a close inspection of all products. Copper Summit, Inc. is not liable for claims made if the customer has signed the shipping receipt without noting damage. If any damage is detected make a note of damage on bill of laden, save the crate, packing material, bill of laden, etc. If possible, photograph the crate and damaged items. The customer is responsible for the unloading and unpacking of the products. Please be careful unpacking the crates, as damage can occur during the uncrating process. Please use a soft cloth to handle copper product to prevent finger prints. If you are looking for ways to “green” your next building project, consider the benefits of copper. Its durability, recyclability and excellent heat-transfer properties help builders meet National Association of Home Builders green building guidelines while conserving energy, natural resources and the environment. Copper, one of the world’s most useful natural resources, is 100 percent recyclable, as are its principal alloys like brass and bronze. 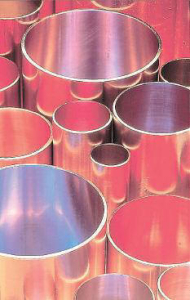 Copper used for plumbing tube; sheet products such as cladding, flashing and roofing applications; heating and cooling systems; and the copper found in brass or bronze builders hardware and fixtures can be recycled over and over with no loss of its physical attributes. In fact, more than two-thirds of the copper used to make architectural, decorative and plumbing tube products is derived from recycled scrap. “It is important for builders to realize that some systems benefit the environment by conserving energy use – and benefit the homeowner by reducing energy and repair bills significantly over the lifetime of the home,” explains Any Kireta Jr., national program manager of Building Construction, for the Copper Development Association. Copper is a key component of many energy-saving technologies. For example, passive solar water heating systems employ copper to capture and convert sunlight into heat. Copper heat exchangers efficiently transfer the thermal energy absorbed by the solar collector to the home’s hot water system. Sunlight is abundant, renewable and, even where it is not readily available, can supplement a home’s hot water needs virtually cost-free once a system is installed. Another option to consider for home heating is a Direct Exchange (DX) geothermal system, which uses a refrigerant directly circulating in underground copper tubing to extract or disperse heat. By exploiting the earth’s constant temperature, DX systems efficiently heat and cool homes and commercial buildings, reducing and in many cases eliminating the need for standard air conditioning and heating. Keep in mind that even standard units benefit significantly as a result of the higher energy-efficiency performance they can derive from copper heat-exchange components. Builders can also use copper to conserve energy through the installation of a heat exchanger for wastewater recovery. According to the Department of Energy, the equivalent of 350 billion kilowatt-hours of hot water is flushed down the drain each year, yet a large portion of this thermal energy is recoverable. This type of heat exchanger typically has a large-diameter copper pipe wrapped in thin-wall copper tubing. Warm waste-water flowing through the larger pipe transfers its heat to the outer coil carrying the home’s domestic water, which in turn reduces the amount of electricity or gas needed to make hot water.